The newest edition of the Dodgers 2017 Sport Crate came in a little light, but that's only because they finally figured out that they can no longer wait for the figurines to arrive at their warehouse. 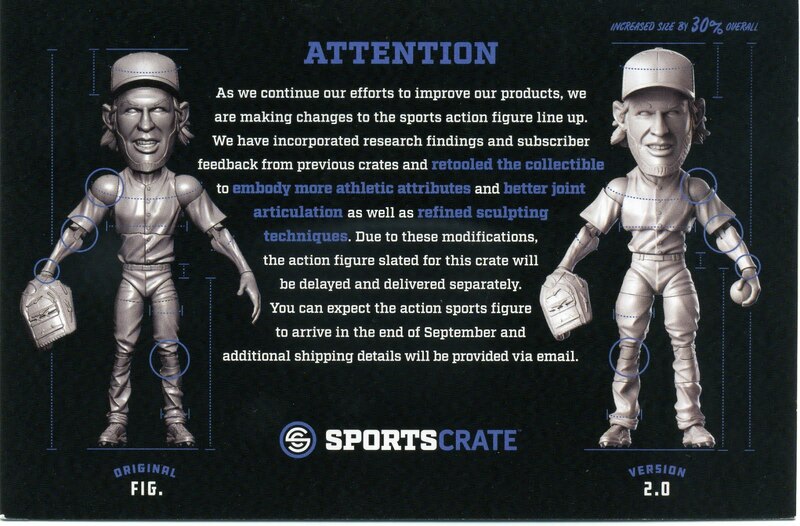 As you may know, their Sports Crates have been fashionably late, so they recently sent emails to their MLB customers indicating that the figurine for the 4th edition of their MLB Sports Crates would not be included. Instead, they would be sending those along to fans in a separate mailer. They even provided a postcard in the crates to explain the situation (see it on the right - click to embiggen). It's their claim that they have made various improvements to the figurines (which they may have), but I wouldn't be surprised if the real culprit is manufacturing related. Regardless, what this means is that instead of being a month or more late with these crates, they are only a couple weeks late. So, I suppose that's good. 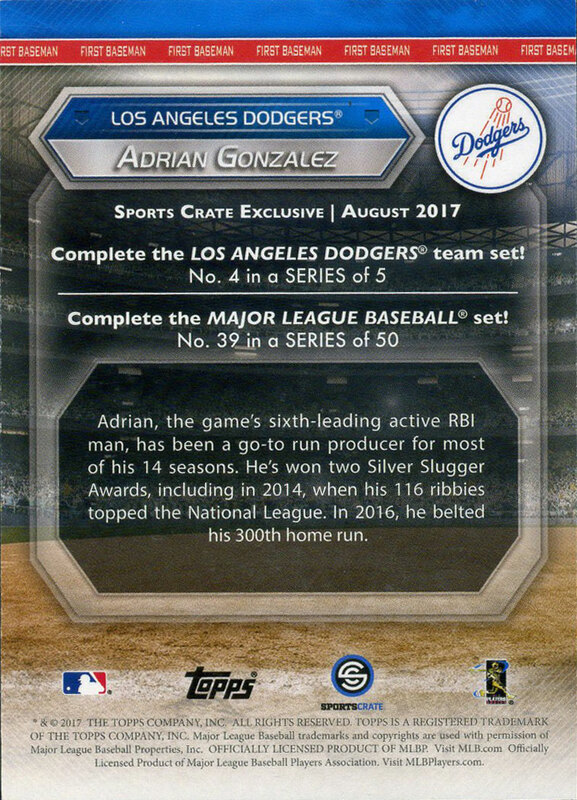 In spite of the missing figurine there is some good stuff in the August Edition of the Dodgers 2017 Sports Crate to fawn over. 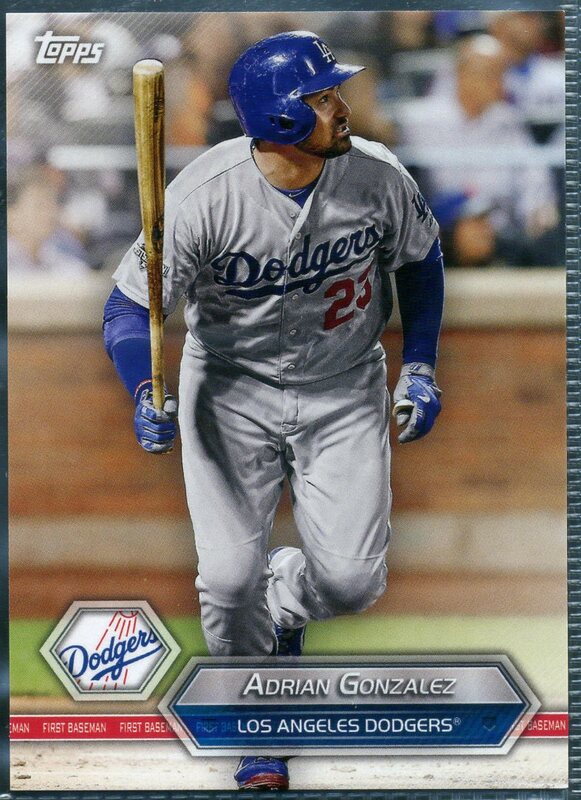 First of all, the Topps card for this month features Adrian Gonzalez (see at the very top), and the figurine that should be coming at a later point is also on him. You can see a pic of it on the left. Additionally, the crate included the above Dodgers Tumbler. As you can see, it includes every Dodger logo -- from Brooklyn to Los Angeles -- ever created. Lastly, they also gave us a '47 branded adjustable Dodger cap (seen below).